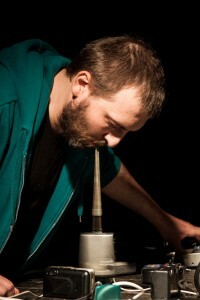 ZENIAL (Lukasz Szalankiewicz) – a sound designer, a historian, a curator. He’s a member of Polish Society for Electroacoustic Music. He has taken part in festivals in Austria, Russia, Bulgaria, Germany, The Netherlands, Czech Republic, Slovakia, Ukraine, France, China, Hungary, Belarus, Romania, Lithuania, Israel, Kazakhstan, Peru, Brazil, Argentina, Urugway, Colombia, Mexico, Ecuador, Luxembourg and the USA (in 2011 on Focus! Festival organised in Lincoln Center by a prestigious university-Juillard and Polish Cultural Institute in New York.) In Poland, Zenial played on the following festivals: Audio Art., Unsound, Wro, and also in Kordegrada Gallery (Warsaw), Zamek Ujazdowski ICA (Warsaw), Arsenal Gallery (Bialystok), Torun ICA and many other places. In his work, Lukasz Szalankiewicz concentrates on sound explorations, as well as audio-visual performances and interactive installations. Apart from typical music activity, Zenial has been engaging himself into promoting Polish artists in the country and abroad, and he’s been an active participant in organising some festivals. He’s also a co-founder of Audiotong label. Lukasz has been recording as Zenial and Palsecam; together with Maciej Szymczuk, he has been working as AABZU. He has also been part of Dizzy Kinetics with prof. Marek Choloniewski.